The International Studies Program was created and inaugurated in 2009 by Christopher Hunter, Head of School, with accreditation of the International Baccalaureate Organization as an IB World School. Blending innovative teaching styles and international partnerships, the International Studies Program includes Foundation Years 1-5 and the IB Diploma Program Years 1–2. The ISP at Ermitage has more than 150 students in its program representing more than 40 nationalities. The school is currently a candidate for the Middle Years Program (IBMYP). The Diploma Program (IBDP) has seen very honorable exam results and university placements since its inception. The ISP offers English-speaking students a unique opportunity to excel in a dynamic learning environment, bringing students from all over the world to become part of a close community of reflective, open-minded learners. 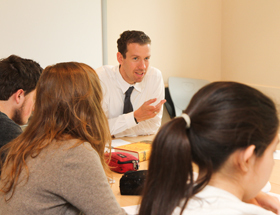 While the program is conducted academically in English, students also have the opportunity to learn French at a level commensurate with their abilities and to connect with the French speakers who are part of the larger Ermitage community and thus develop their roots within French culture. Students within our program benefit from student-centered learning and engage in class-room discussions often in a round table format. Under the guidance of a well-trained and highly dedicated team of teachers, class lessons are intellectually stimulating and aim to encourage inquisitiveness and exploration. Students have ready access to technology in the form of blended learning. Great emphasis is placed on the development of critical inquiry and in-depth research. A wide variety of classroom approaches, along with experiential learning through a great number of service projects and field trips, help promote a broader, more international perspective among our students. I invite you explore our website to find out more about the International Studies Program at Ermitage and look forward to meeting you if you choose to visit our school. Can my child apply if they do not speak English fluently? During the Foundation Years, it is possible that a student who does not learn comfortably in English can enroll, depending on their level; our English Immersion program will provide additional support with language comprehension and writing skills. In order to enter the IB Diploma Program, students must have a strong command of the English language and work at a native-speaking level, including previous experience learning in English. Can my child apply if they do not speak French? French is taught from a beginner to advanced level throughout all years of the International Studies Program. How quickly will my child learn French? We aim for all our students to be competent communicators in both the English and French languages and provide several levels of instructions. Hooray for ICU2's 14 th eye camp! During this year's winter break, 29 Ermitage students accompanied by 5 teachers and the Head of School, Mr. Chris Hunter, teamed up with students and staff from Emerald Heights International School in Indore, India, to screen more than 12000 people for vision problems.